← Photos of our New Lexington Store! The birthstone for this month is the beautiful Peridot! This lovely light green gemstone, which was originally mined on an Island in the Red Sea, called Zabargad, means “Olivine” in Arabic. The gemstones have been found since ancient times. Some of the finest Peridot stones are called “evening emeralds” because they appear greener under artificial light. What is the largest Peridot ever found? This 310-carat fine-quality Peridot from Zebirget, Egypt, is the largest known. Peridot is the gem name for a yellow-green mineral that occurs in volcanic rock. The mineral’s species name is Torsterite. Most of the world’s supply in mined in Arizona, hand-hammered out of basalt. 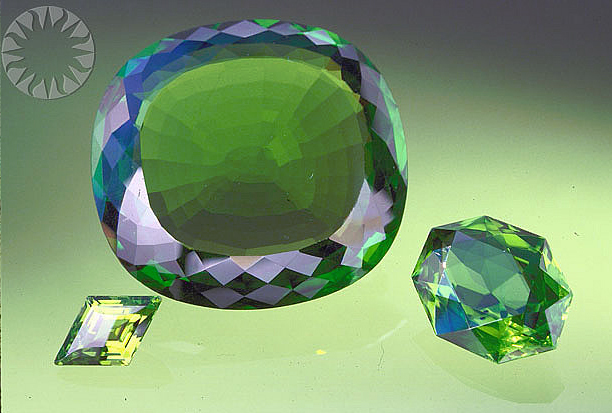 A transparent gem, Peridot has a distinctive oily luster. The color ranges from pale golden-green to brownish green. From the Gem and Mineral collection of the Smithsonian’s National Museum of Natural History. Another interesting historical fact about the Peridot: A 192-carat Peridot stone of fine clear olive-green, is part of the Russian crown jewels, in the Kremlin. See last year’s blog post about the Peridot for more facts and information about this stone! See our Peridot jewelry online here. This entry was posted in Birthstones, Jewelry History and tagged august birthstone, birthstones, Jewelry, jewelry warehouse, peridot. Bookmark the permalink.